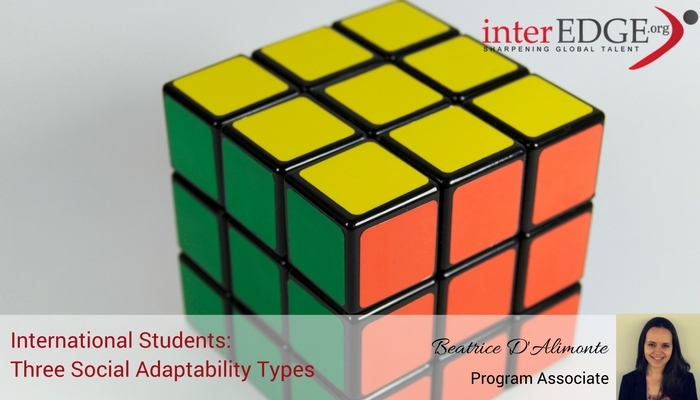 The study identifies three categories of social adaptability styles of students: confident optimists, appreciative optimists, and apprehensive optimists. The study finds out that acculturation processes for graduate students may differ by gender, cultural discrepancies between the country of origin and the host country. A research titled “Understanding International Graduate Students’ Acculturation Using Q Methodology”, published by Hyeyoung Bang and Diane Montgomery in the Johns Hopkins University Press, examines the subjective perspectives of acculturation of international graduate students. It analyzes international students’ insights about their acculturation in the US taking into consideration intrapersonal factors such as cultural, emotional, social, com­municative competencies, the perception of the American culture to find out levels of cultural competence. Through studying a group of international graduate students at a large land-grating university in central U.S., the study identified three types of social adaptability. They are associated with the factors such as student’s previous experiences in their native countries (individualist versus collectivist cultures), gender, the length of stay, language competencies, and beliefs. First, students from East Asia, especially those who share a Confucian heritage, often experience more difficulties to be active in class. Second, East Asian female students encounter more acculturation issues than any other group of international graduate students due to insecurity regarding academic success and future job searching. Confident Optimists: International Graduate students of this type typically demonstrate a high level of self-confidence in their abilities, and are aware of their competencies, strengths, and weaknesses; meanwhile they hold strong opinions about social, economic, political and cultural aspects of the US and appear skeptical or even critical. Their age and length of stay are higher than the other two groups. Appreciative Optimists: Compared to the other two categories, appreciative optimists express greater gratitude to the social, cultural benefits of living in a host country, have an overall more positive attitude towards acculturation and therefore highest well-being among the social adaptability types described by authors Bang and Montgomery. Apprehensive Optimists: Apprehensive optimists tend to encounter issues with acculturation and therefore seem to have express more worries and weaker competencies. Compared to the other types, these students hold overall more negative perceptions of their experiences in the US, doubt more their own communicative competence and show lowest levels of emotional well­-being. The research also pointed out that the success of international students in the host country depends on the level of language competency, the nature of their stress-coping strategies, and an understanding of the host culture. In this context, “cultural competency” is defined as “skill and comfort using the host country’s language” is of particular importance in processes of acculturation. Thus, culturally, emotionally, and socially competent international students with higher communicative skills are less likely to experience social anxiety and more likely to adapt socially in US institutions. Enhancing International Student Programs: Supplement regular international student programs with training, workshops, and resources that help students build “social, cultural and communicative competencies”. Creating and/or Improving the Quality of International Student Orientation Programs: Provide information about acculturation process and consider assessing students acculturation types in order to offer ongoing support. Creating Opportunities for Social Interaction Between International Graduate Students and Host Country Graduate Students: it allows for international graduate students to share common graduate student issues with domestic students. Developing Gender-Specific Group Discussion Programs: Acculturation may differ by gender. Female students may be more vulnerable during acculturation process and can benefit from connecting with others who face similar challenges. How do you build international students’ “social, cultural and communication competencies” to support their acculturation? Share with us your experience by commenting below. Kindly clarify about where online I can find and download, and then ponder, the cited original report of this interesting, and important, research? Thank you in advance for your attention and kind assistance. Today is Monday, September 5, 2016.